If your pet has recently been treated for parasites, it's natural to wonder whether you can catch worms from cats. Though some worms are feline-specific and will not infect humans, certain worms do not discriminate between a cat and the people in your family. Worms are prevalent in cats, particularly kittens and outdoor cats. However, not all worms are transmittable between cats and humans. There are two types of worms that you need to concern yourself with when it comes to human contact: roundworms and hookworms. Can Humans Get Roundworms From Cats? 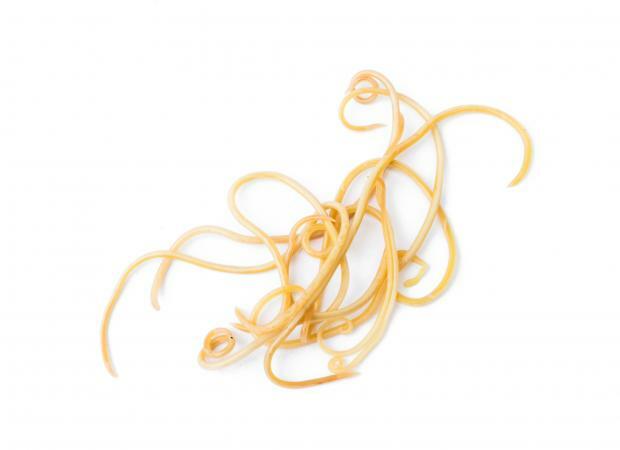 So named for their spaghetti-like appearance, roundworms are white or brown, and they feed off an animal's intestines. These parasites are passed through water, food, vomit, or feces that are infected with roundworm eggs. If someone accidentally ingests any of the eggs that person can become infected. Though uncommon, it is possible for a person to pass these parasites to another person; for example, if an infected person did not wash their hands after going to the bathroom and then prepared food for someone else. Treatment for roundworms in humans can include medications such as Medendazole (Vermox), Ivermectin (Stromectol), or Albendazole (Albenza), which are prescription oral tablets. Prevent further infestations by deworming your cat and washing your hands often, especially after handling your cat's food, water, or waste. Hookworms are worms not visible to humans that affect the lungs and small intestine of an infected person or animal. According to Healthline, infection occurs when a person comes into contact with the soil that contains an infected animal's stool. For example, you could get hookworms by walking barefoot in an area where an infected animal defecates. The infected animal's stool contains hookworm eggs which hatch into larvae, and the parasites attach when skin contact is made. Human to human contact does not spread hookworm. The first symptom for hookworm is usually an allergy-like, itchy rash. Hookworm infections are dangerous for both animals and people. Per Healthline, anemia and nutritional deficiencies are common results of hookworm infections in humans, and can even prevent proper mental development in children who get hookworm frequently. Albendazole (Albenza) or Mebendazole (Emverm) may be prescribed to be taken orally for one to three days to kill the parasites within your body. Avoid future infections by deworming your cat, properly disinfecting areas where your cat may have defecated, and avoiding touching your skin to any of those areas. Because of its name, many people think that ringworm is a type of worm, but in actuality, it is a fungal infection. It is distinguished by a reddish rash that usually has the shape of a ring. It is very contagious, and contact with a cat's ringworm usually results in that person also developing ringworm. It can usually be treated with over-the-counter medication, and it should clear up within two to four weeks. Can Humans Get Tapeworms From Cats? Another common worm found in cats is the tapeworm. These worms are found in the small intestines and in some cases can cause an infection. The most tapeworm found in cats in the United States is the Dipylidium caninum. These tapeworms are unlikely to have any effect on humans. According to the CDC, there are a few reported cases in children. The Echinococcus is another tapeworm that is found rarely in the United States. These are unfortunately contagious and can cause serious medical problems for humans. Can Humans Get Worms From Fleas? Fleas from your cat can potentially infect you with tapeworms although the risk is minimal. The tapeworms are transmitted from fleas that are infected by them and then accidentally swallowed by the cat. The fleas from your cat can also bite you and transmit the worms in this way. Can Humans Get Lungworm From Cats? Lungworm, as the name implies, infect a cat's respiratory system. Humans thankfully are not at risk of being infected with lungworm from their cats. 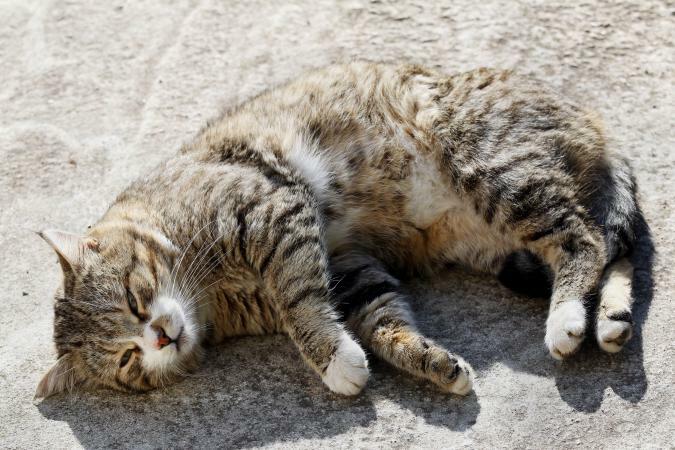 Though some people may not show any symptoms, the symptoms that cats face are the same as the symptoms humans may face when infected with worms. If you have just adopted a new cat or if your cat is showing symptoms of worms, you should administer treatment right away to protect both you and your cat's health. Treatment for a worm infection is usually given orally and can be in pill or liquid form. A veterinarian will prescribe an anthelmintic and treatments can begin on a kitten as young as two weeks old. It may take several rounds of treatment to rid your cat of all the worms it is hosting. The best way to keep yourself safe from worms is to keep your cats indoors. Worms are transmitted through infected animals' stool; if cats do not have access to this, then a worm infection is extremely unlikely, and you won't have to worry about it passing on to your family.